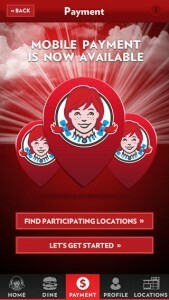 Wendy’s mobile app now comes with mobile payment options for 5800 of its fast food locations. The app allows users to customize order and make a payment, that is taken as a 6-digit code by a real live person. For now, the app does not offer special discounts or coupons, but according to Wendy’s the mobile payment did result in an increase in visits from customers. To use the app for payment, users must add credit to their app using a credit card. The app will also accept existing gift cards as payment options for store credit. The My Wendy’s™ app is designed to help you find a Wendy’s® location near you, display nutrition information, and accept mobile payments at participating locations. You can also use the app to customize your meal, with select premium ingredients and a variety of freshly prepared options, the possibilities are endless! To find the nearest location where mobile payments are accepted, select the Locations tab, expand the filter options, and select mobile payment.